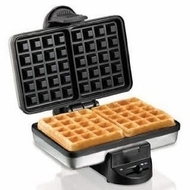 From Hamilton Beach this versatile stainless steel Waffle Maker makes two Belgian-style waffles on non-stick grids. It features power on and preheat lights that indicate when the power is on and when to add the batter. Shade selection ranges from light to brown and crispy. Compact, upright storage.